Aristotle and St. Augusta’s work influenced Descartes's cogito argument and there can be little doubt that they were epistemologists. 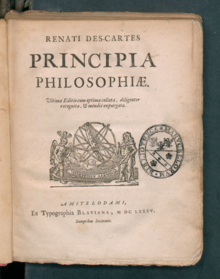 Additionally, there is a remarkable similarity between Descartes’s work and that of the Scottish philosopher, George Campbell’s 1776 publication, titled Philosophy of Rhetoric. In his Meditations on First Philosophy he writes, “[b]ut what then am I? A thing which thinks. What is a thing which thinks? It is a thing which doubts, understands, [conceives], affirms, denies, wills, refuses, which also imagines and feels." Cartesians view the mind as being wholly separate from the corporeal body. Sensation and the perception of reality are thought to be the source of untruth and illusions, with the only reliable truths to be had in the existence of a metaphysical mind. Such a mind can perhaps interact with a physical body, but it does not exist in the body, nor even in the same physical plane as the body. The question of how mind and body interact would be a persistent difficulty for Descartes and his followers, with different Cartesians providing different answers. To this point Descartes wrote, "we should conclude from all this, that those things which we conceive clearly and distinctly as being diverse substances; as we regard mind and body to be, are really substances essentially distinct one from the other; and this is the conclusion of the Sixth Meditation." Therefore, we can see that, while mind and body are indeed separate, because they can be separated from each other, but, Descartes realizes, the mind is a whole, inseparable from itself, while the body can become separated from itself to some extent, as in when one loses an arm or a leg. ^ Chisholm, Hugh, ed. (1911). "Cartesianism" . Encyclopædia Britannica (11th ed.). Cambridge University Press. ^ Grosholz, Emily (1991). Cartesian method and the problem of reduction. Oxford University Press. ISBN 0-19-824250-6. But contemporary debate has tended to...understand [Cartesian method] merely as the 'method of doubt'...I want to define Descartes's method in broader terms...to trace its impact on the domains of mathematics and physics as well as metaphysics. ^ "BBC Radio 4 - In Our Time, Cogito Ergo Sum". BBC. Retrieved 17 April 2019. ^ a b Descartes, Rene (1996). Meditations on First Philosophy. http://selfpace.uconn.edu/class/percep/DescartesMeditations.pdf: Internet Encyclopedia of Philosophy. p. 10. ^ a b c d "Cartesianism | philosophy". Encyclopædia Britannica. Retrieved 27 January 2016. ^ Ree, Jonathan (1991). The Concise Encyclopedia of Western Philosophy and Philosophers. London: Routledge. p. 78. ISBN 0415078830. ^ Ree, Jonathan (1991). The Concise Encyclopedia of Western Philosophy and Philosophers. London: Routledge. p. 75. ISBN 0415078830. ^ Kelly, Anthony (2006). The Rise of Modern Philosophy. Oxford: Oxford University Press. p. 123. ISBN 9780198752769. ^ a b c d e f g h i j k l Copleston, Frederick Charles (2003). A History of Philosophy, Volume 4. Continuum International. p. 174. ISBN 978-0-8264-6898-7. ^ Lennon, Thomas M.; John M. Nicholas; John Whitney Davis (1982). Problems of Cartesianism. McGill-Queen's Press. p. 4. ISBN 978-0-7735-1000-5. This page is based on the Wikipedia article Cartesianism; it is used under the Creative Commons Attribution-ShareAlike 3.0 Unported License (CC-BY-SA). You may redistribute it, verbatim or modified, providing that you comply with the terms of the CC-BY-SA.